Below you will find a chart outlining our basic web design packages. Please keep in mind that these are basic web design packages and may not fit every website need. If you find that your web design needs do not fit into any of these packages do not be concerned. We can accommodate your specific web design needs by building a custom package tailored specifically to your needs. Website design details are listed below pricing charts. Ok, so you’ve looked over the packages and like what you see — you are probably wondering, “what do I do next?”. Well, we are glad you asked! All you need to do to get your web design project started is fill out this simple contact form and we will be in touch shortly. If you prefer you can always reach our office by phone at 704-794-8785. We can also arrange to talk through Skype for those living outside of the USA. Whatever method you choose we look forward to meeting you and discussing your web design project. If you are interested in an eCommerce site design please see our special eCommerce Shopping Cart page for pricing information. The facts are that more and more people are surfing the web on mobile devices (e.g. iPhone) and tablets (e.g. iPad). In today’s technologically advanced society it is important that your site be accessible on multiple platforms and screen sizes. This is why we offer complete responsive web design in addition to the packages listed below. Responsive websites are those that recognize their environment and adapt to the screen in which they are being viewed. 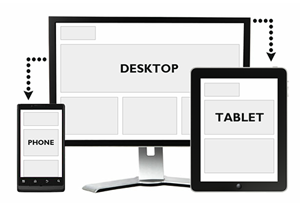 A site built with responsive design will automatically resize for different devices. When you contact us ask about how a responsive web design can take your website to the next level.